Finally after about three months or so, if not longer, I am finished reading Three Cups of Tea. It was a good book, but for me a slow read, and especially slower due to school, wedding planning and a million other things that placed the completion of this book on the back burner. But school is done for the semester, I am married and the ‘million other things’ have taken care of themselves in one way or another. When I first saw the book on the shelves of Barnes and Noble a year ago, I was immediately intrigued by it because of its title: Three Cups of Tea. For anyone who knows me, I absolutely LOVE tea. I drink it all of the time, even in, as my husband says, 100 degree weather. I do not know why I love it so much but sometimes I think that I should have been born in England where whole meals are designed around the drinking of this great obsession. Anyhow, shortly thereafter, one of my teachers recommended it due to its content. I found myself asking for a copy for Christmas and at what seemed like a reasonable time, launched into it. As I mentioned before, it started off a little slow speaking of the authors mountain climbing adventures in the Middle East which I was not the least bit interested in. Yet, I was determined to keep reading it because I just knew that it would be a great book because my teacher told me so and I trusted his opinion. And it was! 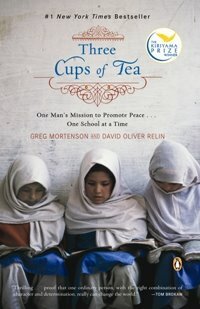 I appreciated the author, Greg Mortenson, and his approach to fighting against terrorism, not with guns and war, but by building schools and providing a solid education to at-risk children throughout Pakistan and Afghanistan. I say ‘at-risk’ because without the schools that he provided, children who desired an education would have no other option but to surrender themselves to madrassas, schools that force its adherents to oblige to a strict form of Islam in support of Jihad. I am in favor of Mortenson’s less conventional approach. He addressed the roots of terrorism, instead of fighting against its symptoms. He understood that without education, people do not have much say over their future and will submit themselves to whatever opportunities emerge. He also understood the value in educating girls, something that prior to his building, was not heard of. For him, if a girl could reach even the fifth grade level, the rate of maternal mortality and child mortality would decrease, addressing 2 of the 8 Millennium Development Goals ending global poverty by 2015. If I were you, I would check it out.